Heat engines require cooling, to turn heat energy into mechanical energy (and then, via a turbine-connected generator, to electrical energy). This is an unavoidable physical principle, and is typically exploited via the Carnot cycle. Usually, this cooling requirement uses water. Nuclear power plants consume large amounts of water –35-65 million litres daily. Indeed nuclear power is the thirstiest of all energy sources. A December 2006 report by the Commonwealth Department of Parliamentary Services states: “Per megawatt existing nuclear power stations use and consume more water than power stations using other fuel sources. Depending on the cooling technology utilised, the water requirements for a nuclear power station can vary between 20 to 83 per cent more than for other power stations.” Global warming and water shortages are likely to exacerbate problems experienced by the nuclear power industry during heatwaves in recent years. Nuclear power plants in several countries, including France and the US, have had to operate at reduced capacity, or to shut down temporarily, because of reduced water supply or to avoid breaching regulations limiting the heat of expelled water. So what’s the story? Are water limitations and discharge regulations destined to be a major limiting factor for nuclear power, especially for places that are experiences increasing water shortages, such as Australia? The short answer is no — this is classic FUD. For the longer answer, read on. All thermal power plants, by definition, make use of heat engines with heat exchangers, and so require cooling (although this need can be reduced in various ways, as explained below). This includes coal-fired, nuclear fission, oil-fired, conventional gas-fired, solar thermal and geothermal power stations. The renewable energy sources that don’t have this cooling requirement are hydropower, wind, wave, tidal and solar photovoltaic power. Water is used in two ways in thermal power plants: (a) Internal steam cycle: to create steam via the energy source (fossil fuel combustion, fission chain reaction, heat exchange with deep rocks [hot dry rock geothermal] or a heat transfer fluid [concentrating solar power]) and convey it to an electricity-generating turbine, and (b) Cooling cycle: to cool and condense the after-turbine steam (this condensation dramatically decreases the volume of the expanded steam,creating a suction vacuum which draws it through the turbine blades), and then to discharge surplus heat to the environment. In the internal energy transfer water circuit, only a comparatively tiny amount of water is lost (this is the case for nuclear, coal, conventional [rankine cycle] gas, etc). It’s effectively a water –> steam –> water –> steam –> water etc. closed-loop system. In a pressurised water reactor (see diagram), there are two steam loops, only one which is exposed to the nuclear core. In a boiling water reactor, there is a single internal water circuit. Clearly, this cannot be what worries people, as the water consumption for an internal steam cycle is essentially a once-off affair. So let’s look at (2), the cooling cycle. The amount of heat discharged to the environment depends principally on the plant’s thermal efficiency. High efficiency is achieved by having a large temperature differential, whether it comes from high internal heat or a low temperature external environment, or both. The thermal efficiency of today’s nuclear power plants are around 35%, whereas hotter coal burners can reach 40% or more. Advanced high temperature gas- or molten-salt-cooled nuclear reactors (AHTR) can reach efficiencies as high as 70%. Bottom line: higher thermal efficiency = lower water usage. In this context, hot dry rock geothermal, which operates at fairly low outlet temperatures of 150 — 250 °C (compared to 300 — 550°C for nuclear and 850°C for AHTRs), doesn’t look that great. The options for wet cooling are once-through (direct), or recirculating. Once-through uses water from a large body — the ocean, a big lake, or a high-flow river — to bring in water and then reject roughly the same amount after cooling, which is a few degrees warmer; there is little net loss. To use the recirculating method, water is drawn from some available source (e.g. a river) and then water is sprayed down hyperboloid-shaped cooling towers, which exploit the physics of evaporation, in a natural chimney draft, to cool the water. Using the recirculating method, roughly 2.5 litres of water are lost to evaporation per kWh of electricity generated. A typical 1 GWe plant operating uses about 75 megalitres per day (25 Olympic-sized swimming pools). Some countries only use once-through cooling using only sea water (which is in infinite supply) — UK, Sweden, Finland, Japan, Korea, China, etc. Canada uses water from the Great Lakes. In the US and France, coastal plants use sea water and a large number of inland reactors use cooling towers or once-through river/lake sources. For Australia, this raises an important point. Our coal-fired power stations are clustered in regions such as the Latrobe and Hunter Valleys. Why? Because that way, they’re located right on top of the coal seams. When you have to feed 4 million tonnes of this black rock into a 1 GWe plant each year, it makes a lot of sense to avoid te need to move hundreds of thousands of loaded rail cars across the country, and instead to put your electricity generation plants where the fuel is (if you can — in most of the US, they can’t). The caveat is that you must use the water that can be piped to these locations — fresh water — for recirculating cooling. However, if Australia replaced all of its coal plants with nuclear reactors, it could save all that valuable fresh water. Why? Because their geographical location is unconstrained by the fuel supply, since an utterly trivial 25 tonnes of fuel must be supplied to a light water reactor, or just 1 tonne for a fast spectrum or thorium reactor. As such, all of the nuclear power plants could be built along the coastline and cooled by sea water. An alternative, for any thermal plant, is dry cooling, whereby heat is transferred directly to the air via high-flow forced drafts (using industrial-sized fans, finned radiator pipes etc.). This is a less efficient method than wet cooling, because the cooling fans consume considerable power and the temperature differential that’s established is necessarily smaller. Yet, it may end up being the only feasible option for large-scale desert-based solar thermal power. The sunny and dry desert is one place where water scarcity really bites. For instance, a German solar developer, Solar Millennium, has reluctantly decided to use a dry-cooling method for their two 250 MWe (peak) CSP plants, after the nearby residents feared their aquifers would be sucked dry by the use of 1.3 billion gallons of cooling water per annum. The inefficiencies created by air cooling will increase the size of the mirror fields required to yield a given amount of power. For some interesting further reading on this proposed solar thermal project (with an ecological impacts slant), see here. Naturally, if water is a real limitation in a given area that requires electricity, then what’s good for the solar thermal goose is good for the nuclear gander — nuclear power can use air cooling too, if necessary. Or, in most cases, you take the win-win option of saving inland fresh water by closing down coal plants and building your nuclear plants by the sea. I guess Friends of the Earth didn’t think of these points — or, perhaps, they just chose not to mention them. But at least now, having read this TCASE post, you’ll not be tricked by this anti-intellectual sleight-of-hand. For further information, I can thoroughly recommend that you read this from the WNA: Is the Cooling of Power Plants a Constraint on the Future of Nuclear Power? 1. The local ecology is messed up out to a square kilometer or whatever because very local temps do rise, killing some sea life. This of course is answered that it’s so minimal as to be irrelevant; that diffuse discharge can be engineered where all this is minimized. 2. Rising sea levels with threaten any coastal reactor over the next century and could create a catastrophic environmental disaster if they get flooded. This is of course is answered with nuclear contributing to possible reversing this problem; that plants can be bermed; that sea level rise of 1 to 2 meters can be engineered either in plant siting; that the initial perhaps 1 meter rise actually increasing the efficiency of any plant by lowering energy needs pump up cooling water to the turbines, one sees this at my plant with low vs high tides. As much as 5% can be gained when we have extra-high tides. Sea side reactor need not be built at sea level. Kirk Sorensen has an innovative solution, build under sea housing for the reactors. The navy does that and calls it a submarine. Heller indirect dry cooling is in use worldwide, including one Russian nuclear power plant above the artic circle. (They must have a “hard water” problem during winter.) From that EPRI workshop website, look at: http://mydocs.epri.com/docs/AdvancedCooling/PresentationsDay1/17_EPRI%20Paper%202008_animált_Balogh.pdf I personally think that this is the best solution. Following up, could it be that the existing nuclear power plants are situated on the coast or near large bodies of water is that the emergency cooling methods required this water to be pumped through the core for a worst-case loss-of-coolant-accident? The problem in Australia is that the population is strung out along the coast. Even some of the remotest stretches of coastline have fishing shacks. A possible boost to acceptance of NP is the disquiet over the indirect CO2 emissions and cost of grid powered reverse osmosis desalinated water. This is happening in all coastal cities except Darwin and Hobart. A couple of days ago when the PM opened the Capital Wind Farm outside Canberra the turbine blades hardly moved in the hot calm weather. Yet we were assured it was all to ‘offset’ the grid energy required by Sydney’s Kurnell desalination plant. Er, maybe not so much when the wind doesn’t blow. The cheaper alternative of course is to incorporate multiflash distillation in the external cooling system of the thermal plant. If that thermal plant was nuclear it would have to be on the coast but within pumping distance of a city reservoir system. Again NIMBYism will raise its head. Fred’s fishing shack might have to be relocated or our fish and chips will become radioactive or the sea will become too salty or too warm or something. Sea level rise, for the life of a seaside power plant, would probably be small compared to changes in sea levels due to the highest high tides, especially combined with storm surges or 500 year tsunami risks. Building a plant to account for rising sea levels ought to be mostly taken care of, engineering wise, in dealing with those sea-side issues. The top of the gulf already has elevated salinity (35g/L I think) and tidal flushing rather than sea currents. Those power stations should be replaced by low carbon plant which if thermal should be on open coastline, not landlocked. SA’s 2 geothermal experiments Geodynamics and Petratherm haven’t announced any milestones lately. Their steam is a mere 250C which if cooled to 50C gives a Carnot efficiency bound of 200K/523K = 38%. I understand the mixed ammonia-water working fluid in the heat exchanger may help. However the underground water loop must be closed because there is precious little top-up water in the desert and it also contains radon which for some reason greenies don’t object to. the other two main arguments Friends of the Earth made against nuclear in the pamphlet they distributed before your talk at Union Hall was that the Switkowski report showed that building five nuclear plants would only reduce Australia’s emissions by only 4% if they replaced coal fired power stations. This point is a joke as 80% of Australia’s coal and gas fired power stations would still be running in this case. i.e. if you were to replace ALL of our coal/gas fired plants with nuclear you would reduce total national emissions by close to 25% – the numbers they published on their pamphlet confirm this. The other point they made was the nuclear cannot be the solution as it only displaces 25% of emissions at most since it can only generate electricity – but in any description of how solar and wind will off-set emissions they’ll talk about transport fuels being replaced by electric cars. How can they expect to have it both ways? It seems absurd to me that friends of the earth would bother printing pamphlets with what are such easily defeated arguments. I was going to suggest a TCASE covering all of their claims but honestly don’t believe it would be worth your time. There are applications like district heating where, for at least part of the year, some of the rejected heat can be used. Of course this is only true in places that have harsh winters. Thanks for the concise explanation and rebuttal. 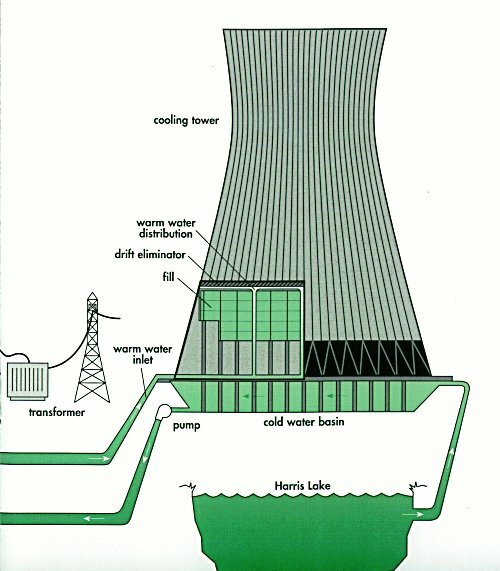 Both of your graphics would benefit from captions – especially the cooling tower graphic – to tie it in to your brief on evaporation enhanced air cooling. On the evaporation losses, is it possible to estimate a relative value? I’m not sure how to do this, but to begin with, is the quantity involved meaningful? Certainly the total heat emitted into the atmosphere is not meaningful. I was wondering about the value of the fresh water “lost” to evaporation in relation to similar losses from normal river/reservoir surface evaporation; to losses from boundary leakage from rivers, irrigation channels, etc.? And what about the societal cost of the evaporation losses compared to the life cycle of coal generation? This would probably be better put in terms of litres per kW·h of heat to be disposed of, since the consumption per kW·h(e) varies so much with the efficiency of the system. Steve…all true but these were often arbitrary limits that could of easily be suspended. I should point that during these excursions, there was almost zero wind available as well. “Site licenses have been granted for the new Seversk nuclear power and heating plant in Russia’s Tomsk Oblast. There are also several plans to apply reject heat for desalination, one in particular by coupling a low-temperature evaporation (LTE) desalination unit to the cooling loop, which seems to be the most well thought out at the moment. Something like this would be of more interest to Australia than district heat, I would guess. I can still see one argument being used against nuclear in relation to water consumption. That is, outside of Australia there are a lot of really large cities/centres away from the coast, with huge and/or growing energy demands. While ~40% of the world’s population lives within 100km of the coast, there is obviously still a very significant percentage of the human population living quite large distances from the coast. If a nuclear power plant really does require 20-83% more water per kWh to operate, this could be considered a problem. Also, just for discussion’s sake, I’ve noticed references to desalination in a few reply comments on BNC recently, in terms of nuclear being able to provide plenty of power for them. Do commenters really think scaling up desal is a good idea? I’m not against the technology as such, but certainly have my reservations (particularly when they’re proposed for the Upper Spencer Gulf, which is infuriating). Just a thought, I’m open to ideas. … A US report, ‘Licensed to Kill: How the Nuclear Power Industry Destroys Endangered Marine Wildlife and Ocean Habitat to Save Money’, details the nuclear industry’s destruction of delicate marine ecosystems and large numbers of animals, including endangered species. Most of the damage is done by water inflow pipes, while there are further adverse impacts from the expulsion of warm water. (See the report and video at NIRS: nirs.org/reactorwatch/licensedtokill.) Another documented problem is ‘cold stunning’ – fish acclimatise to warm water but die when the reactor is taken off-line and warm water is no longer expelled. In New Jersey, local fishermen estimated that 4,000 fish died from cold stunning when a reactor was shut down. A small number of air-cooled coal-fired electricity plants exist but they have a number of disadvantages – higher capital cost, lower efficiency resulting from the higher turbine back pressure, greater greenhouse gas emissions. All new CCGT plants of 500 to 1000 MWs now being built in California are built with air cooled condensers. And yes, they take a hit. The true impact is very small for once through cooling. It is extremely localized and usually involves fish larvae and smaller creatures not, say, a salmon or stripped bass, few of which ever get caught up in the traveling screens of a thermal plants. The real fish kill problem exists in rivers and some lake side once through cooling where the confines of a river can cause downstream thermal stress. That’s true but only when the intake temperatures of the upstream/intake really rise above normal. What is often not in this reports (and in fact I’ve never seen it stated) that the naturally occurring high temperatures of the intake or ‘normal’ flow itself can cause the same kind of thermal stress on fish as the outfall from a power plants. Why? This is because the average delta-t of intake and outfall water temps usually never runs more than 15f. At my power plant, it never runs more than 10f. These delta-ts are are regulated by local water districts. Another issue is the “fake” temperature differences that occur. Fake because the reservoir that might be constructed by the thermal power plant becomes a regulated recreation area, stocked with fish, often at the utilities expense, and then they are forced to curtail their load because an agency comes in *after the fact* to argue about ‘fish kills’. Another fake environmental argument, which occurred in France in that famous one time temperature excursion that forced many plants to curtail out put and wind power to fall to zero, are in rivers with little or no fish life at all anyway. Yet the regulations are national and can’t be touched even if the rivers are to mineralized to support any marine life. For sea side thermal plants, the issue is cooking the marine larvae and fish eggs as they go through the condenser tubes. This is all true of course and I can attest to the piles of herring roe, for example, that gets stuck to the inlet condenser tube sheet at my plant. But there is, according the independent biologists that run marine assays of the outfall, almost not true effect on the marine stocks whatsoever. The actual % of dead marine life, which touted in the ‘billions’ because of their small size, is made up for by space in the ecosystem as this very small number of microscopic critters are destroyed and taken out of the environment, making yet more room for their brothers and sisters. Considering what we’re up against, the extremely small “fish kill” that nuclear plants would present is statistically irrelevant against the “human kill” we are facing with climate change and particulate caused respiratory deaths. Jim Green, You, of course, take a very one sided view of the environmental consequences of nuclear power plants, The discharged cooling waters may in some instances provide habitat for some rare or endangered species. Plant buffer zones, also provide wildlife habitat. An objective assessment of the total environmental impact of a nuclear plant might find more harm than good. Certainly building a nuclear plant does not require bulldozing 4 square miles of land as a 1 GW solar thermal plant would. The Kogan Ck and Millmerran coal fired supercritical water power stations in Queensland use air cooling. In heat waves I understand they spray water on the outside of the condensers which is hardly water conserving. I’d guess the reason for air cooling is to locate the station close to outback coal deposits. In the case of gas fired plant I’d guess the reason for air cooling is to avoid the need for expensive seaside real estate. However if NSW and Vic build baseload gas fired plants of up to 2 Gwe the choice of air cooling means unnecessary CO2 will be produced as a result of lower efficiency. If the fuel penalty for steam cycle plant was 20% that could take CO2 to 700 grams or more per kwh, nowhere near good enough. I don’t see why sea level rise is a problem. You simply need to locate the seaside plant on a low headland such as Port Stanvac in Adelaide’s case. This is an engineering issue for plant location and design but doe not dictate the choice between nuclear and coal. Barry’s point about water supply being an issue for all thermal plants is well made. In the recent SEQ drought output was reduced at the Tarong power station because of lack of cooling water in the nearby lake and the need to ration that water for other use. Same problem for all thermal power plants. If there is no beneficial use for the so-called reject (or waste) heat, then consider dry (air) cooling towers and accept the thermal penalty. Considering that the water quality is not a factor here, why isnt waste or salt water purified/desalinated from the excess heat, this would not only eliminate the issue entirely, it would also make tremendous use of that excess heat generated, Ironically in a manner that provides us with even more fresh water! Jim Green – whether your comments on the adverse effects of the nuclear power cycle on wildlife are true or not is unimportant if you consider the likely extinction of most species, maybe even humans, if workable solutions to AGW/CC are not implemented urgently. This blog has demonstrated how the renewable power options ,favoured by green groups, will not provide baseload power and thus cannot replace the CO2 belching coal fired plants. Your stance against nuclear power is, in fact, condemning the animals, plants and Earth systems your organisation was set up to protect. Unless, of course, lobbying against nuclear power has now become your prime raison d’etre! Yes, nuclear power has very little fresh water requirements. But more important than that, it can be used for water desalination. An energy rich world (which is achieved by nuclear power, but not by solar power) can afford to run desalination plants which shall help in outdoing some of the scarcity in drinking and agricultural water. And the most ridiculous of all arguments is on sea-level rise. If sea-levels indeed rise, protecting extremely tiny nuclear power plants won’t be our biggest problem. A large swathe of our world’s urban centers will be wiped out, along with tidal and mangrove forests. We should be breaking our heads about how to protect them, and if possible, to prevent such calamities from happening altogether.. There seems to be an amazing inconsistency between the goals and actions of FOE, Greenpeace and their fellow travellers. They wish to power modern society with renewables. Yet, in Australia at least, they have opposed wind turbines, citing bird destruction, sucessfully prevented the building of the Franklin above Gordon Hydro scheme and are now seeking to have Lake Pedder restored to it’s former state. Thus closing an operating Hydro power plant. Now, either this is inconsistent, or they march to the beat of a darker drum,one alluded to by Finrod in other posts. The environmentalist campaign against a faceless, powerful ‘monster’ like centralized energy can strike a chord with a large section of public opinion today because the scares they are leveraging are not based on science but express a sense of people losing control of their lives. But it is worth asking whether the strident denunciations made by environmental campaigners represent an attempt to take back control over our lives. Or is this a campaign that makes a virtue of ignorance, feeding off the fear of an unknown future? The evidence suggests that the environmentalists’ campaign against centralized energy production is part of the problem, not part of the solution. The more fierce leading environmentalists rail against centralized energy production, the less obvious is their alternative idea of how society should be powered. Some have made it clear that the alternative is a return to small-scale generation – not a programme that is immediately on the horizon regardless of rhetoric to the contrary. Others harp back to an imaginary land of Cockaigne where happy peasants live like Tolkien’s Hobbits, gather their own firewood, and trade their needs at the village fayre. This is about as far as many environmentalists get when it comes to alternative suggestions – it is so much easier to create fantasies than to put them in practice. Whatever the environmentalists’ intention, upholding such a rural idyll can only serve to justify conservative reaction. Nature and the natural order features so large in the emotional arguments of the environmentalists because it seems to be emblematic of a lost harmony. The myth of a natural harmony in which everything remains static was exploded as long ago. But the facts are less important than the sentiment. And the sentiment is that we have disturbed the natural order by messing with nature, and this can only be repaired by returning to a simpler age. In fact the clock is never turned back – that past never existed – but in the here and now resistance to change becomes the norm. In this fairytale version of events, centralized energy stands for disruption of the natural order. As they turn their fire from proven risks to the more intangible risks of social harm, it appears that environmentalists are making sense. But actually the same prejudice persists, about there being a natural order that we disrupt at our peril. Only this time, it is a imaginary Arcadia that must be preserved at all costs. Nuclear desalination will create NIMBYism times two. Vocal members of the public don’t want desal plants and they especially don’t want them with NPPs. I see in Qld that Anna Bligh has said the need for desals can be avoided if household water consumption is kept under 200L a day. That will cut out backyard vegie growing. 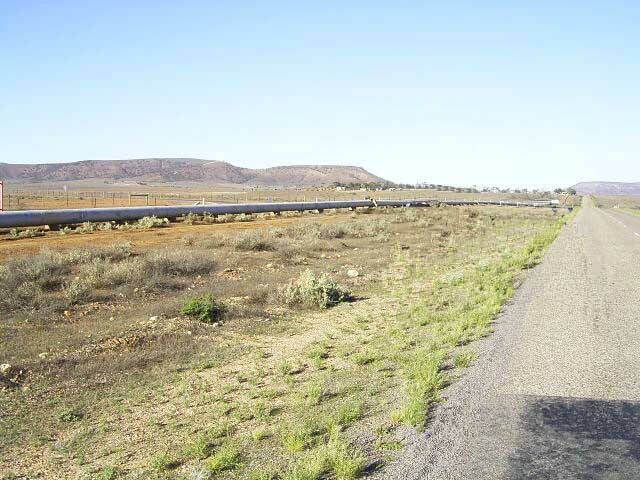 I’ve said before a good reason to supply more power and water than is needed for the Olympic Dam expansion is that this water pipelinecan be disconnected, freeing upstream flows in the distant River Murray. Another NPP and desal on SA’s Fleurieu Peninsula could replace the Pt Stanvac reverse osmosis desal under construction. SInce SA windpower produced 70 Mw from 807 Mw nameplate during the heatwave all of that can be the offset just for Pt Stanvac. A whole bunch of new wind power will be needed for non-desal purposes. Re the aborted Franklin Dam I think that was about 220Mw. I believe there could be 10 times that amount of unused capacity in already built Tasmanian dams if pumping could be done cheaply enough. John: Where does that 70/807 figure come from? There is a strategy to overcome Nimbyism – cite nuclear power plants in areas of economic disadvantage. The locals will pick the jobs over other concerns. Governments seem to do this all the time with the location of unpopular facilities like prisons, and it seems to work. So a nuclear plant in the La Trobe Valley to replace the coal plants, or near Port Augusta, would be likely to be accepted in my view. If Rann has to step aside as a result of political scandal I’m not sure whether that will help or hinder SA’s long term energy and water problems. I think he is a closet nukularist but those around him are vehemently anti, though the public is swinging round. Teragon, on November 21st, 2009 at 14.23 — The reject heat is at a bit less than bioling hot. There isn’t enough heat left to run anything (otherwise it would have been used, not rejected). About the only use for desalination I can see is that it would only take a small amount of solar energy to evapoate some of it. The evaporated portion makes some fresh water and the brine goes back to the ocean. Unfortunately, even this might not be as efficient as reverse osmosis. Somebody better at thermo than I ought to check. the condenser temperature is more like 30 degrees Celcius, which isn’t much help towards reaching evaporation. I like to add another erk of mine re environmentalists refusal to accept Nuclear power. Once the science of CC was accepted we had to come to terms with the ramifications, and here I understand very well the denialists comparisons of CC “activists” to religious zealots. Since we are the cause of climate change the environmentalists say so must we be made – through sacrifice and repentance – to atone for our sins. A pall of guilt has descended upon the people of the west. Every everyday thing they do from driving the kids to school to owning a pampered pet, is bad or wrong. People are constrained from relieving this guilt not just by the social structures and infrastructures we’ve built but also by their desire to maintain them. We like our freedom to much to succumb to the dictates of an authoritarian power telling us how we ought to live every detail our lives. This is a dangerous position. Where guilt cannot be relieved it is rebelled against. The drop in concern about CC reported recently in Australia is, I believe, a symptom of this rebellion. Denialism is another. A head in the sand response, yet another. This cannot go on! The environment movement is engendering a silent revolt, a rebellion of inaction, much more dangerous than any simple laziness (which is the implied reason for inaction and – in the form of sloth – yet another sin). Their refusal to accept anything that doesn’t equal atonemt, will, in the end, be their ruin. It need not be humanities. The promotion of cornucopian solutions (to steal from Finrod) is I believe our best shot. Who doesn’t want to be told they can have more of whatever it is they desire and actually feel sanctimonious about it? According to the study, in the USA, Nuclear consumes 1.5 to 2.7 liters of water per kwh of electricity produced. Nuclear can & does use gray water for cooling. Only 3.3% of total Water Consumption in the United States is for thermoelectric power generation. 80.6% is for irrigation. Which brings up the real culprit in unnecessary water consumption – namely – Biofuels & Biomass for Thermoelectric Power generation. The Greens, the EU, the UN, and environmental lobby groups like Greenpeace are big on Biofuels & Biomass burning for energy. The UN, Kyoto & the EU actually count biofuels and biomass thermoelectric power generation as Carbon Neutral. Utter nonsense. The average corn ethanol fueled ICE vehicle uses 150 liters of water per km, mostly irrigation water, about 4.7 liters of water per km of ethanol processing water. The average Soya biodiesel fueled ICE vehicle uses 599 liters of water consumed per km, using Merson’s numbers. Compare that with the average Electric BEV, powered by Nuclear Energy, uses 1.7 liters of water per km, about 1/90th of the corn ethanol vehicle and 1/350th the biodiesel vehicle. That millions of children will die, to fuel the biofuel vehicles, just adds misery to the madness of biofuels. Nuclear is not a significant water user – biofuels are the real issue here. And we’re not counting the pollution caused by agricultural run-off – the ocean dead zones. It takes 4.5 hectares of corn to fuel the average SUV for one year in the U.S., according to Pimentel (accounting for all energy inputs), enough land to feed 44 people, vs 3000 kwh of electrical energy, worth about $51 of Nuclear Electricity, with average nuclear energy production cost of 1.7 cents per kwh in 2004 in the USA. So Denmark burns straw in their thermal power plants. Normally the straw will consume Carbon from the atmosphere, decay or be composted or plowed back into the soil, returning nutrients & carbon to the soil, where most biomass carbon is stored. Burning straw is mining the soil of nutrients, one of which, phosphorus is likely to become in short supply in the near future. It also ACTUALLY DOES RELEASE THAT CARBON INTO THE ATMOSPHERE. Alternatively, the land that is used to produce biomass could produce forests which will capture carbon from the atmosphere, storing it indefinitely, in the trees, in the soil, and if harvested for timber, in buildings. Or the land could produce food for hungry people – a much more ethical use of the water & land. Therefore I must conclude that all rainfall consumed by biomass used for biofuels or for thermoelectric power plant fuel is freshwater consumed. So with Denmark’s annual rainfall of 6100 M^3 per HA per year. Excellent yield would be 50,000 kwh per HA per year, assuming air dried. So that amounts to 172 liters per kwh of electric energy for a 40% efficient power plant. Compare with 1.5 liters per kwh for the Nuclear Electricity. Similarly, including rainfall consumed plus irrigation water for biofuel production, puts the Corn Ethanol powered vehicle up to over 500 liters of water consumed per km, and the Biodiesel ( Germany is big on Biodiesel) powered vehicle at over 2000 liters of water per km traveled, vs the Nuclear Electric powered vehicle of 1.7 liters per km. I should have added that according to the Merson report, Hydro uses 17 liters of water per kwh of electricity produced. Due to evaporative losses in the Hydro reservoirs. Approx. 10X higher water use than Nuclear Electricity. My own view is that CHP works much better with Nuclear than with Biomass burning anyway. Why? Because the regions that need CHP most are Northern areas, or the Antarctic, where Biomass is nil, or of extremely low productivity, and building heat is needed 8 to 12 months of the year. The high grade heat of the Nuclear Power plant is also very useful to supply process & building heat to remote Mines. Small Nuclear power plants like the Hyperion or the Toshiba 4S would be ideal for these applications. What ever happened to the Slowpoke III? Thanks for the comments and replies everyone — most of the questions posed seem to have been answered by others. If a nuclear power plant really does require 20-83% more water per kWh to operate, this could be considered a problem. As I said, the amount of additional water that a nuclear power plant will use depends on its thermal efficiency. In high temperature reactors, will be much less water per kWh than a lower-temperature coal or gas burner. Geothermal and solar thermal fresnel plants will, for instance, require even more water per kWh because of their relatively lower thermal efficiency. The idea is that seawater passed over the condenser for the working fluid (the external heat exchanger) is prewarmed almost for free. Slight vacuum causes hot salty water from that process to evaporate when sprayed into a chamber with cooled walls on which fresh water condenses. The brine is then passed to another ‘suckier’ chamber then another until it progressively becomes cool. A combination of falling oil prices after the panic in the 70’s, and indifference at AECL. most days, wind wasn’t a lot of help. John Newlands, on November 22nd, 2009 at 18.10 — Thanks for the info! strategy for fighting global warming. I doubt that this personal view will sell well.